(Nanowerk News) Proteins are the building blocks of all living things, and they exist in virtually unlimited varieties, most of whose highly complex structures have not yet been determined. 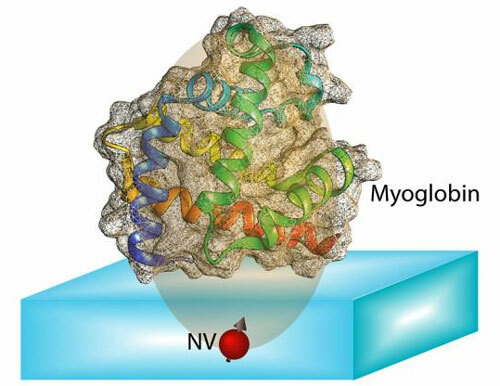 Those structures could be key to developing new drugs or to understanding basic biological processes. Now a new technique being developed by researchers at MIT and elsewhere shows great promise for producing highly detailed images of individual proteins, no matter how complicated their structure, without the need for crystallization. 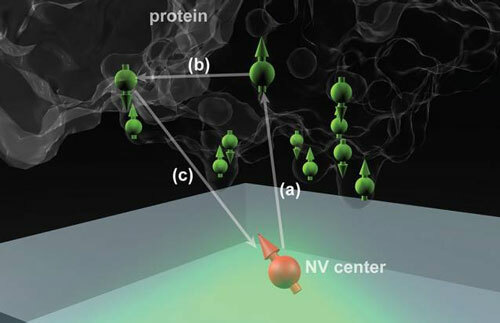 The findings are described in the journal Physical Review X ("Atomic-Scale Nuclear Spin Imaging Using Quantum-Assisted Sensors in Diamond") by MIT graduate student Ashok Ajoy, postdoc Ulf Bissbort, associate professor of nuclear science and engineering Paola Cappellaro, and others at MIT, the Singapore University of Technology and Design, and Harvard University.